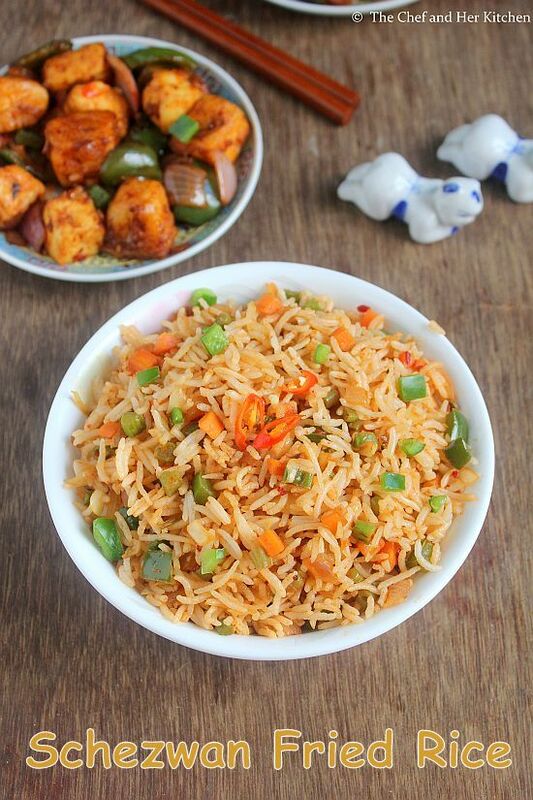 If I am given a chance in between a regular Veg fried rice and Schezwan fried rice I would definitely choose the latter as I love the schezwan varieties very much. 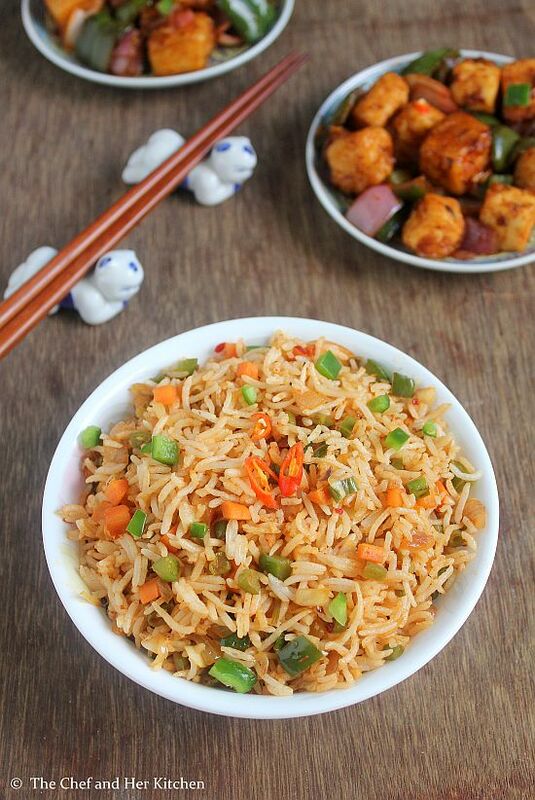 The slight sweet and spicy schezwan sauce makes the fried rice extremely delicious.You can serve the schezwan fried rice as it is or pair it with any manchurian gravy.Chinese recipes take lot of time in preparation work but in order to put up the final product it does not take much, you can finish the tossing in just mins if you have all the ingredients ready.It tastes best when it is done on high flame,so its better to keep all the ingredients handy before you start the tossing job. In restaurants the Chinese food taste still better when compared to the home made version as they usually toss in the high flame and it also lends a nice smoky flavor which is difficult to recreate in the home made version but nevertheless it tastes nice.I have mentioned few tips and tricks in notes section, so please go through it to make delicious schezwan rice at home. 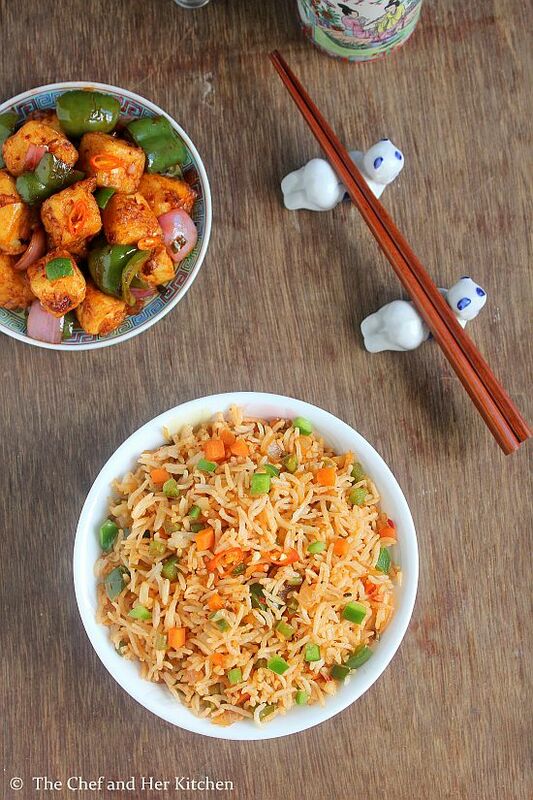 The secret of Schezwan fried rice lies in the Schezwan sauce preparation , if you get the sauce right the fried rice tastes just delicious.I had prepared this Schezwan fried rice for a week end lunch recently and served it with Chili Paneer, that was one delicious meal which we thoroughly enjoyed. Soak Basmati rice for 10 mins and cook in rice cooker with (1-rice:2-water) ratio and cool the rice completely. 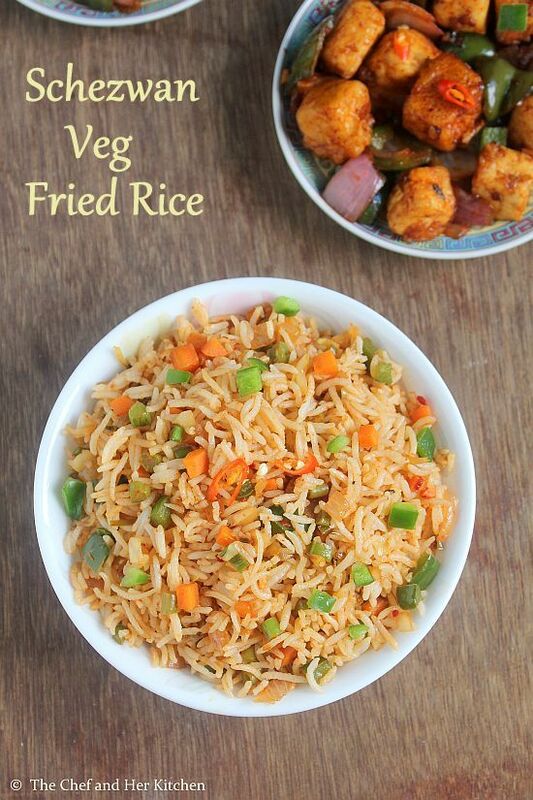 Apply some olive oil to it and mix well and keep it aside, it is best if you refrigerate for 1/2 hr so that rice holds its shape when frying it. Cut the vegetables finely as mentioned. Heat olive oil and sesame oil in a big wok over a high flame and add finely chopped ginger, garlic and celery pieces and fry until they turn slight crisp. Add thinly sliced spring onion whites(or onions) and fry them on high flame until they turn soft. Add chopped carrot, beans, cabbage and stir fry on high flame for 2 mins. Do not let the carrots and beans loose its crunchiness, they should be crisp and crunchy and hence do not stir fry for long. Add sliced capsicum to it and fry again for a minute. Add salt, pepper powder, vinegar, schezwan sauce and soya sauce and mix well. Do not add more salt as all the sauces contain some salt. Add cooled rice and spring onion greens, slightly run the rice through your fingers while adding to the wok so that it does not have any lumps. 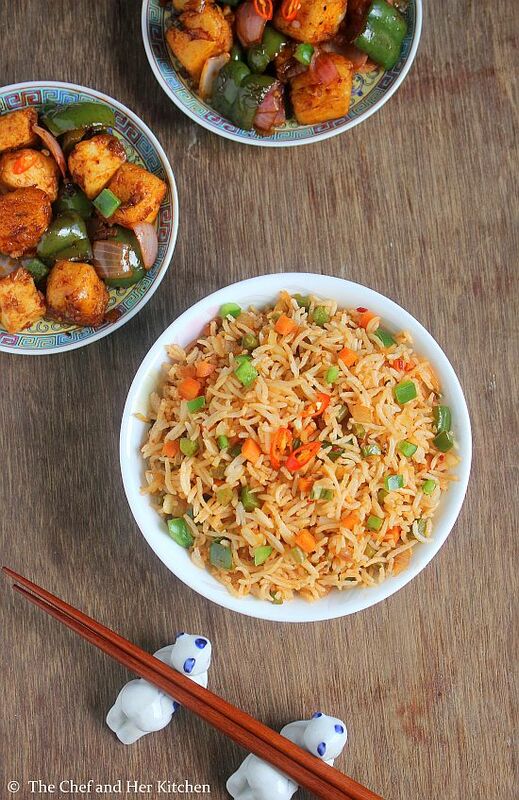 Mix everything well until the rice is hot and do this gently and take care not to make the rice mushy. Serve it piping hot with any Manchurian gravy. 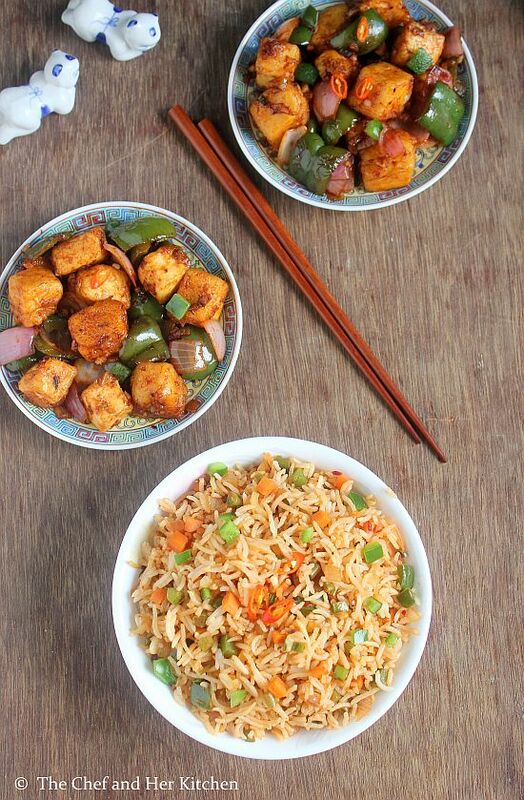 I served it with Dry Chilli Paneer. In chinese cooking Ajinamoto (chinese salt) is added to give extra taste, I have not added to it as it is supposedly not good for health. If you would like to add feel free to add 1/2 tsp Ajinamoto along with pepper powder. I recommend you to refrigerate the cooled rice at least for half an hour which helps the rice in holding the shape while frying. If you are preparing it in large quantity, mix all the rice together and toss small portions of rice in a tbsp of oil and serve it piping hot. The entire cooking is to be done over a high flame which helps in retaining the crispiness of vegetables and the flavor of the dish, so you should be quick while sautéing the veggies and rice. You can adjust the spiciness of the rice according to your wish. You can use white pepper powder instead of black pepper powder, as I did not have it at that time I used freshly ground pepper in it. 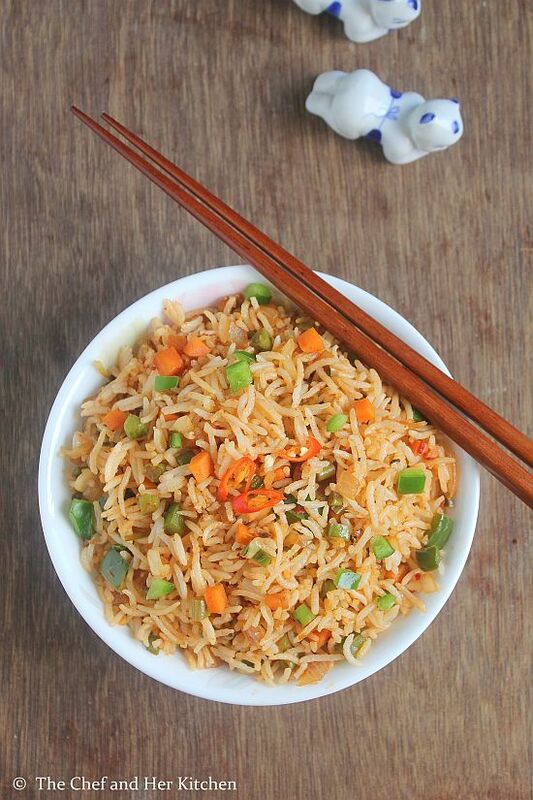 Fried rice looks super delicious! Yummm. This increases my appetite.. I love fried rice.. Prepared the Schezwan sauce and rice for lunch & it got done in no time! It was very yummy!!! I tried it today ...fried rice were super delicious. .. Every one loved it..;) and I got so many compliments. .
Wow this look delish. I would like try this tonight with my dinner. Thanks for sharing this great recipe.